Timmy Turner, Director of the award winning surf film, Second Thoughts, will appear at the Surfing Heritage Museums Friday Afternoon Surf Film Series on August 28th at 3 pm. Turner, local soul surfer from Huntington Beach, has made the waters of Indo his home away from home. 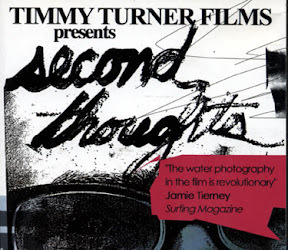 Second Thoughts was a Surfer Magazine Surfer Poll Awards Best Movie winner. Alone on an uninhabited Indonesian island in the middle of nowhere, Timmy and his friends, Brett Swartz and Travis Potter, are dropped off for a month. Once there, they have "second thoughts" about their month-long island stay. While braving the elements with little food and water, what follows is some of the most amazing surf footage on the sickest reefs in Indo. Meet Timmy at the Surfing Heritage Foundation Museum, on Friday, August 28th, and watch the matinee screening of Second Thoughts starting at 3 pm. Admission is only $3 (free for SHF members) and includes free popcorn!